Resistance to pipelines have taken a devastating toll on the fossil fuel industry in North America. 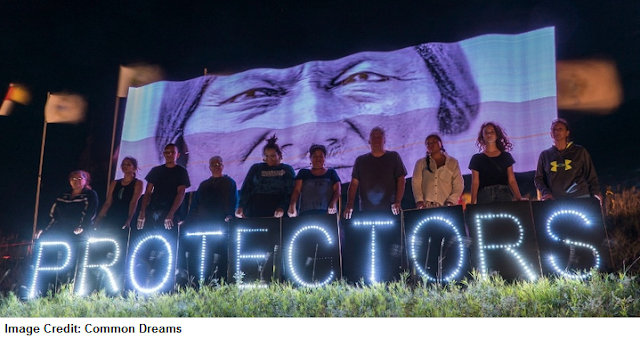 Most recently protectors have succeeded in halting the construction of the Dakota Access Pipeline (DAPL). The the Keystone XL, the Northern Gateway, the Sandpiper Pipeline and the Kinder Morgan gas pipeline from upstate New York to Dracut have all been cancelled thanks to activism and now DAPL has been stopped. Efforts to defend the land have been led by a large coalition of indigenous groups. As reported by Democracy Now, Bank of America, HSBC, UBS, Goldman Sachs and JPMorgan Chase are financing DAPL. Another key financier is Wells Fargo, the same bank that just fired 5000 employees for setting up accounts which customers did not ask for. This is more than simply support for a pipeline, this is support for more oil and gas production translating to more greenhouse gases. If completed, the Dakota Access pipeline would carry about 500,000 barrels of crude per day. DAPL privater security guards have attacked Native Americans with dogs and pepper spray as they resisted construction of the pipeline. Indigenous groups continue to operate within the law seeking a legal injunction to stop the pipeline. Although a federal judge denied the Standing Rock Sioux tribe’s request for a temporary injunction to halt the construction of DAPL. This decision was overridden when the Obama administration refused to issue permits. The Department of Justice, the Department of the Army and the Department of the Interior issued a joint statement saying that work along Lake Oahe will be halted pending further review. In the interim these government agencies have denied the necessary permits effectively putting DAPL on hold to give the Army Corps time to reconsider. "The Army will not authorize constructing the Dakota Access pipeline on Corps land bordering or under Lake Oahe.. Therefore, construction of the pipeline on Army Corps land bordering or under Lake Oahe will not go forward at this time... we request that the pipeline company voluntarily pause all construction activity within 20 miles east or west of Lake Oahe." The statement goes on to make a bold statement about the need to have a, "serious discussion on whether there should be nationwide reform with respect to considering tribes’ views on these types of infrastructure projects."